Here’s a bit of Olympic/Disney trivia for you: Did you know that the Olympic opening ceremony in Beijing actually cost more to produce than it originally cost to build Disney’s California Adventure? It’s true! It is common to find guests in the U.K. pavilion wandering about looking for the entrance to the “chunnel” to the France pavilion. In 1989 a group of protesters smuggled sledgehammers into the park and attempted to bring down a wall in Germany. Cast members in the American Adventure occasionally have to be disciplined when they forget themselves and attempt to hire day laborers from the Mexico pavilion. After sneaking into Disneyland more than an hour before opening (it’s amazing what you can do when you’re disguised as a planter), our Official DisneyLies Photographer managed to snap a picture of an Imagineering test of the new Antimatterhorn. This Matterhorn overlay — accomplished in minutes thanks to billions of carefully installed, computer-controlled black-light LEDs — is intended for use during this year’s Halloween festivities. 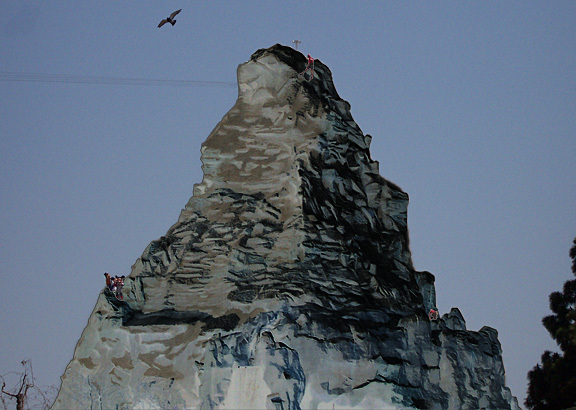 Rumor has it that, when the Matterhorn is in “evil” mode, the mountain will not only look evil, but the cars will also be fitted with super-bumpy wheels and the Yeti will have a really, really bad haircut (sort of an “abominable mullet,” according to an Imagineer).